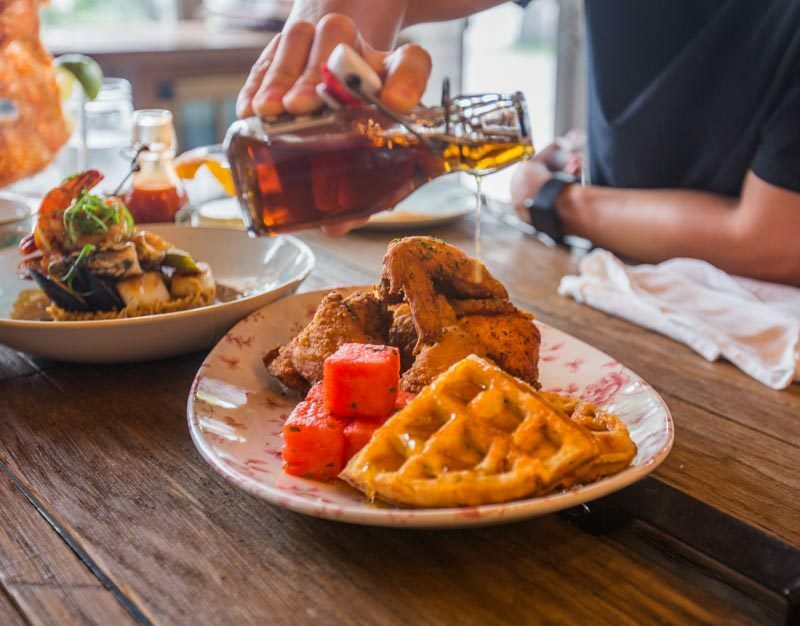 When I think of Southern cuisine, fried chicken, biscuits and whiskey come to mind. 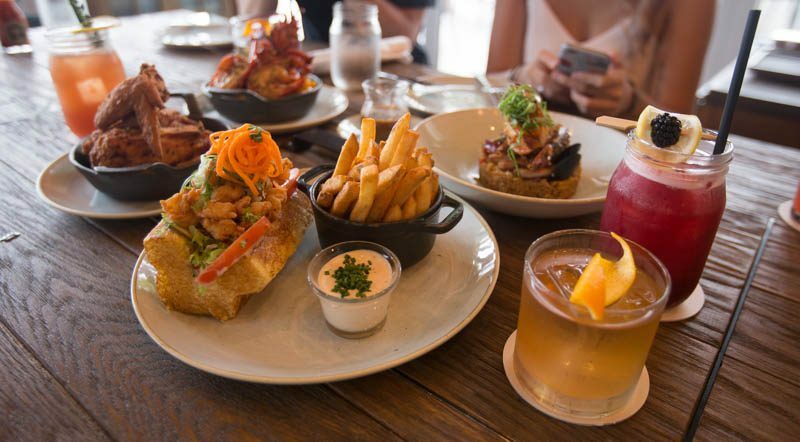 The Bird Southern Table & Bar at The Shoppes at Marina Bay Sands brings the best of Southern American culture and cuisine to Singapore in a casual and inviting atmosphere, overlooking the glistening Marina Bay waters. 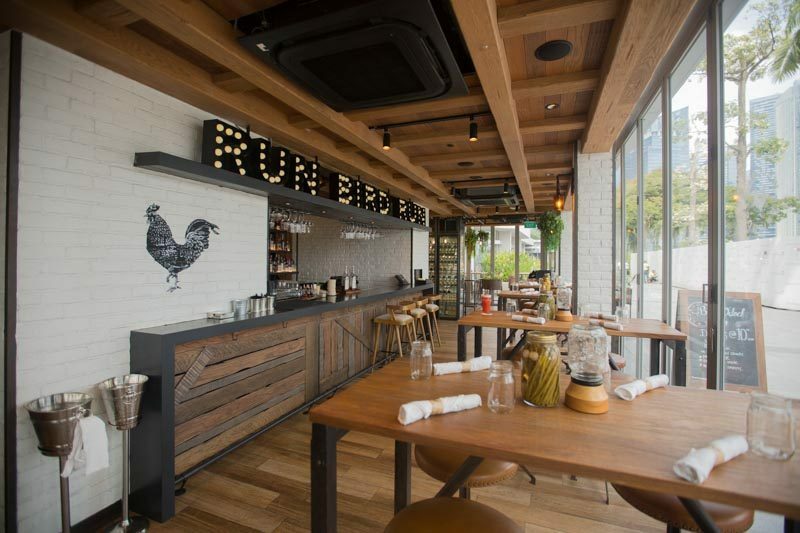 The interiors are decked with rustic wooden finishing, creating an inviting and warm atmosphere. We took a seat on the upper level, in the comfort of the air-conditioned indoor seating area, hungry (as usual) as we await for lunch. 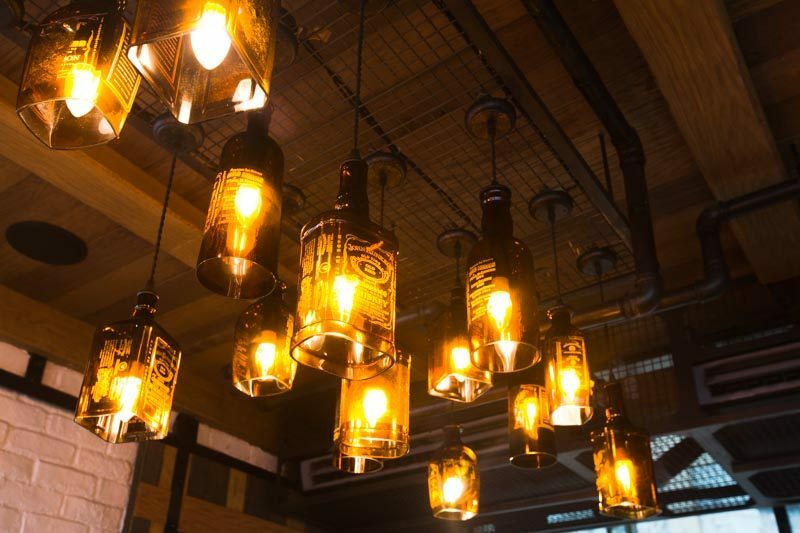 A quick look around and I noticed the restaurant’s attention to detail, like how they use Jack Daniel’s whiskey bottles as light fittings to create the mood and ambience for a wholesome dining experience. To get us started, the staff got busy with preparing us some drinks while we waited for the food to arrive. Here at SethLui.com, anytime is a good time for drinks — though it was only a quarter-past noon when we visited, I was already excited to try some of The Bird’s popular cocktails! 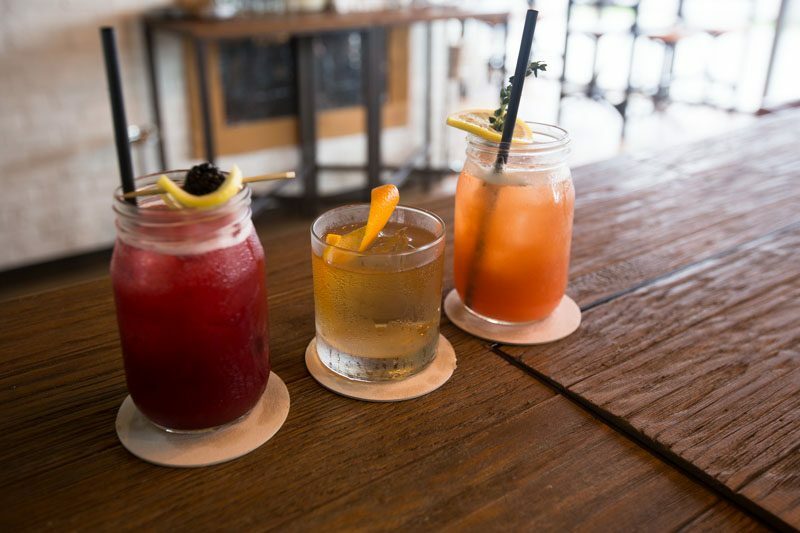 The Blackberry Bourbon Lemonade (S$19) is the signature cocktail made with Wild Turkey Bourbon, blackberry puree, fresh lemon, cardamom and Agusta bitters. 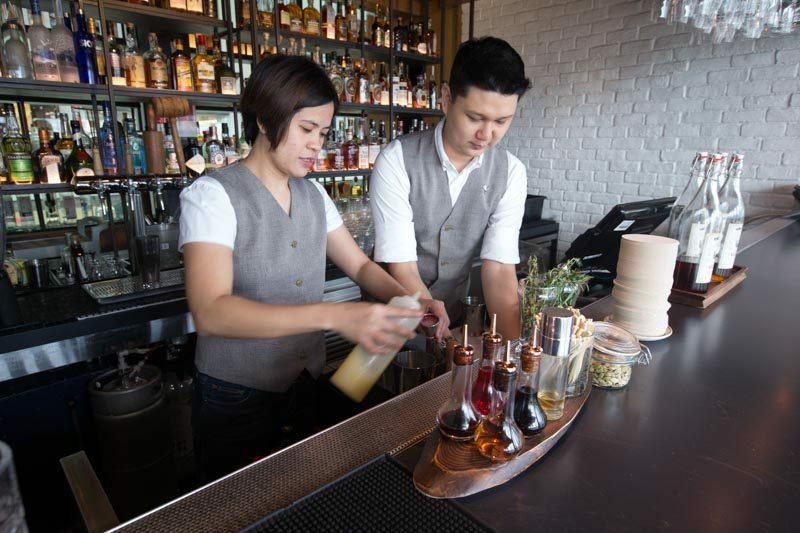 It is tarty, sweet and refreshing – perfect for Singapore’s humid weather. It’s no wonder it is popular with the crowd. The Bird Old Fashioned (S$22) features bacon-infused Wild Turkey Bourbon and maple syrup balanced with orange and aromatic bitters. The smokiness from the bacon-infused bourbon was a tad subtle and would have won my heart if it was stronger. The Southern Peach (S$19) is light and easy to drink, the perfect tipple for Sunday brunch. Maybe it’s time for a change of your usuals and have this lovely concoction instead. Among the three drinks, this was my personal favourite. 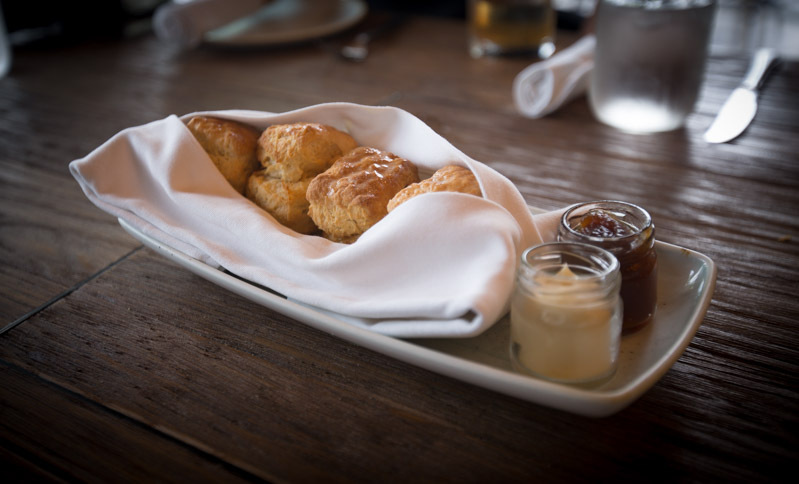 We started our meal with freshly baked Buttermilk Biscuits (S$12). The biscuits are a mixture of sweet and savoury, complemented with honey butter and pepper jelly. The pepper jelly has the same consistency as jam and it has been dulcified to give it a sweet taste. The dishes were being served one after another. Ambrosial is what I would describe the spread to be; every dish looked like a masterpiece. We were salivating and couldn’t wait any longer to dig in. 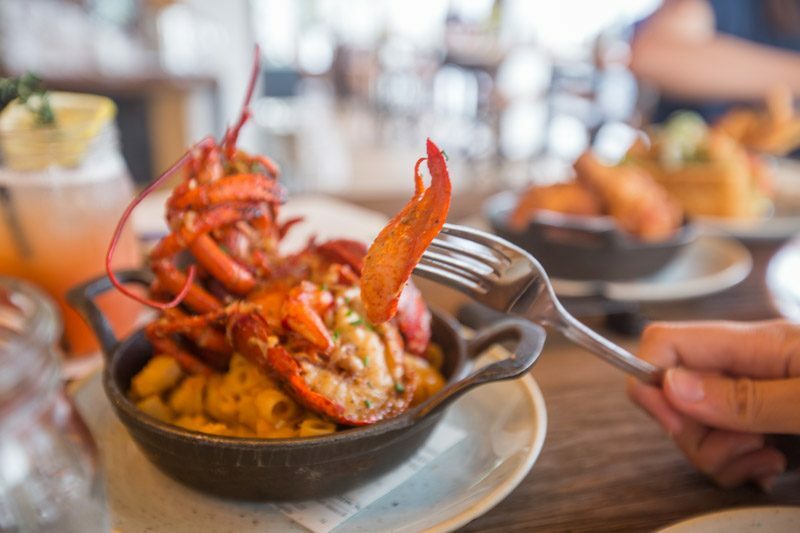 Appealing and inviting, the Lobster Mac & Cheese (S$64) is an elevated and decadent rendition from the regular mac & cheese, with an entire lobster resting atop the dish. 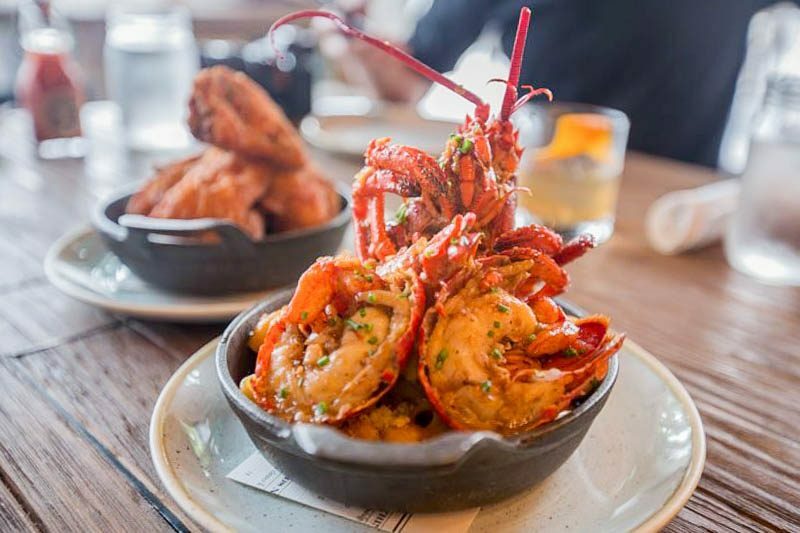 The whole Maine lobster is first basted in butter, garlic, shallots and white wine, and it was a pleasure on the taste buds as it caramelises the lobster, further bringing out its natural flavour. A five-cheese mornay makes the base for the Mac & Cheese. It wasn’t as sharp as I thought it to be, in fact, it was creamy and mellow. We were bobbing our head in approval while munching on the juicy, fresh and succulent lobster meat that came off easily from the shell. 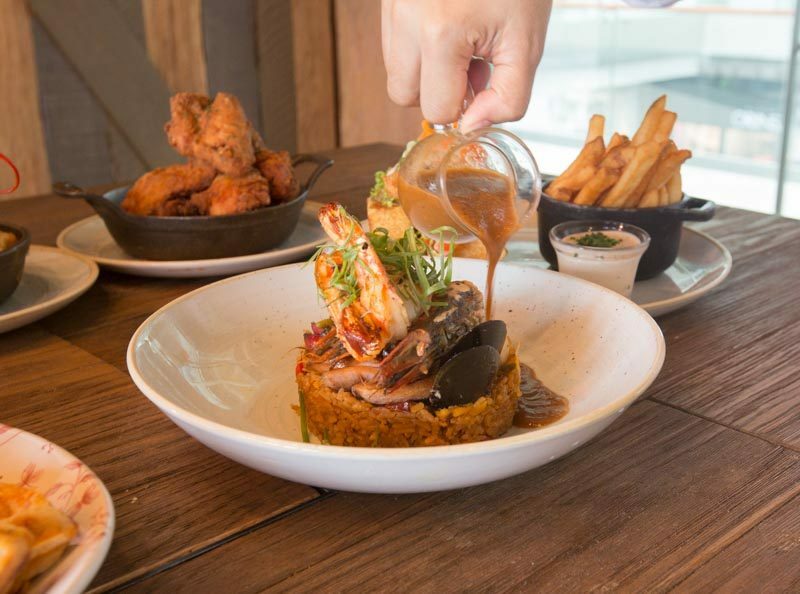 One of the main highlights on the menu is the Jambalaya (S$46). For the uninitiated, Jambalaya is reminiscent of the Spanish paella, and Creole Jambalaya originates from the French quarter of New Orleans where they recreated the dish. 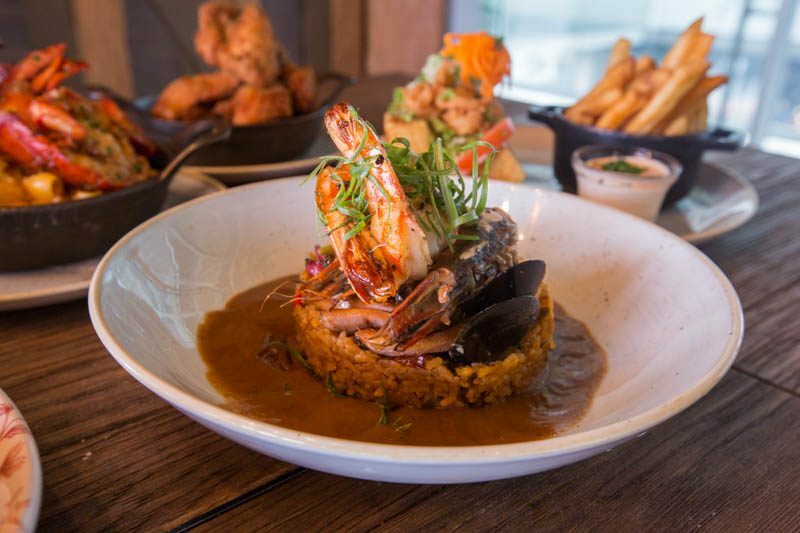 The Bird’s Jambalaya consist of five main ingredients: spiced rice, scallops, tiger prawns, mussels and spicy chicken andouille. The Gumbo sauce is made with lobster & crab stock which takes three days to make! The idea is to mix it all together, allowing the gumbo sauce to cover the rice and sauteed seafood, making every bite warm and comforting. Next up, we tried the Chicken ‘N’ Watermelon ‘N’ Waffles (S$34), it’s what they are famous for and for good reason. The preparation begins with a 27-hour brining process, followed by coating it in a secret recipe of spices and flour before frying it in special pressurised fryers for the meat to be juicy. The waffles were made with Swiss Cheese on the inside and cheddar cheese on the outside and sprinkled with chives. Paired with the bourbon-infused maple syrup, it gave the right combination of sweet and savoury. Initially, I was confused as to how the spiced watermelon would play its part in the dish. Mixed together with lemon juice, chilli spices and mint, it was more tangy than sweet and acted as a palate cleanser in between bites of the chicken and waffles. 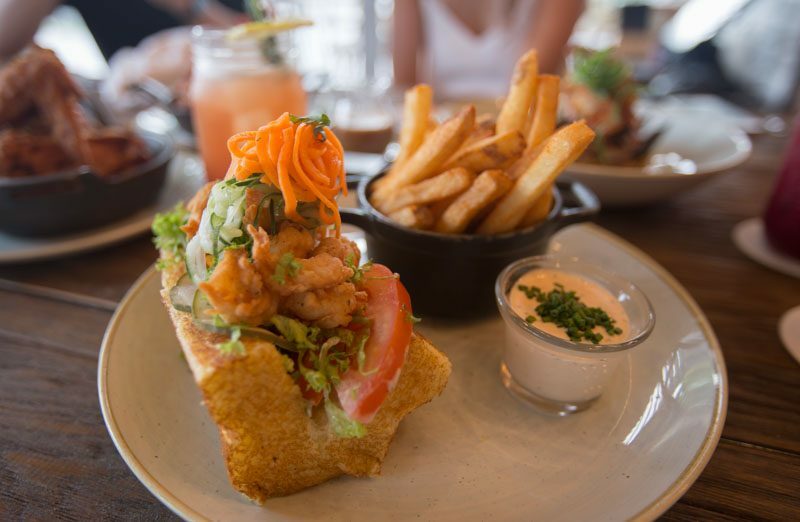 Up next is the Shrimp Po Boy (S$26). A popular local theory claims that “Po’ Boy” was coined in 1929 at a New Orleans restaurant where the owners Benny and Clovis Martin, served their former colleagues’ free sandwiches. They were jokingly referred to as “poor boys” or “po’boy” in Louisiana slang, and soon the sandwiches took the same name. The shrimps were crunchy and coated evenly in the batter. The brioche was light and fluffy, and the remoulade brought the whole dish together with its spice. 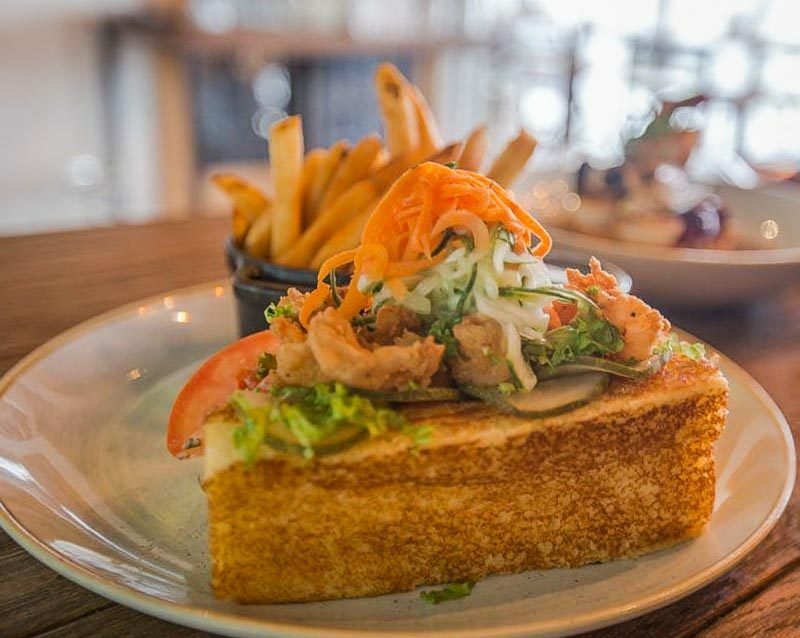 The pickled cucumbers and carrots add a little crunch and sharpness, creating a nice texture to the deep fried shrimp and soft grilled brioche. If this is considered a “poor boy’s” lunch, I won’t complain. 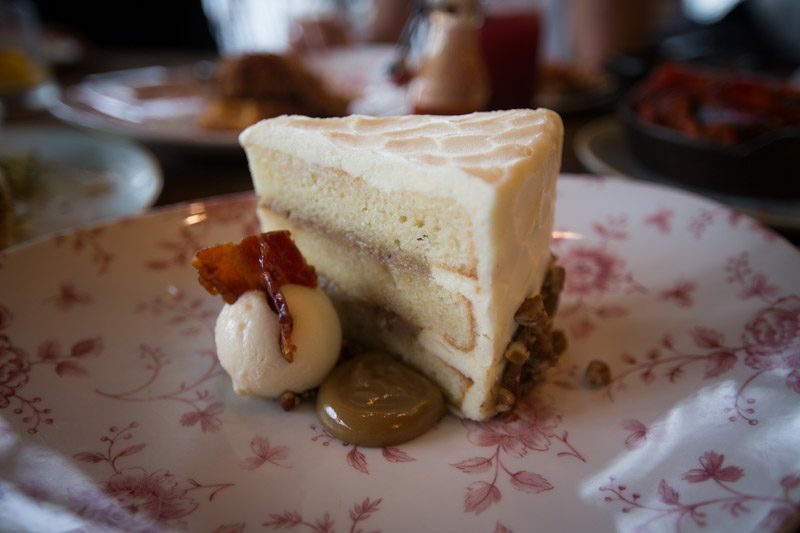 We ended off the meal on a sweet note with a classic Butterscotch Cake (S$18). The frosting is infused with bacon, being huge bacon fans we would have liked the taste to be more distinctive. The accompanying bourbon ice cream and dollop of butterscotch sauce went well with the cake and added the finishing touches to the dessert. The meal was a pleasure for the palate and we left with our tummies full and happy. The next time you’re here, do ask them about the history of the Southern American heritage.